In the opening keynote at Semicon China today, Dr. Tzu-Yin Chiu, CEO of SMIC, gave a run-through of their technology portfolio, and in doing so let out a few details of their sub-40 nm process development. It appears that they are actually shipping some 40-nm pilot product for revenue, and to keep the ARM-world happy, they will have Cortex A9 cores running at 1.2 GHz by the end of the year. 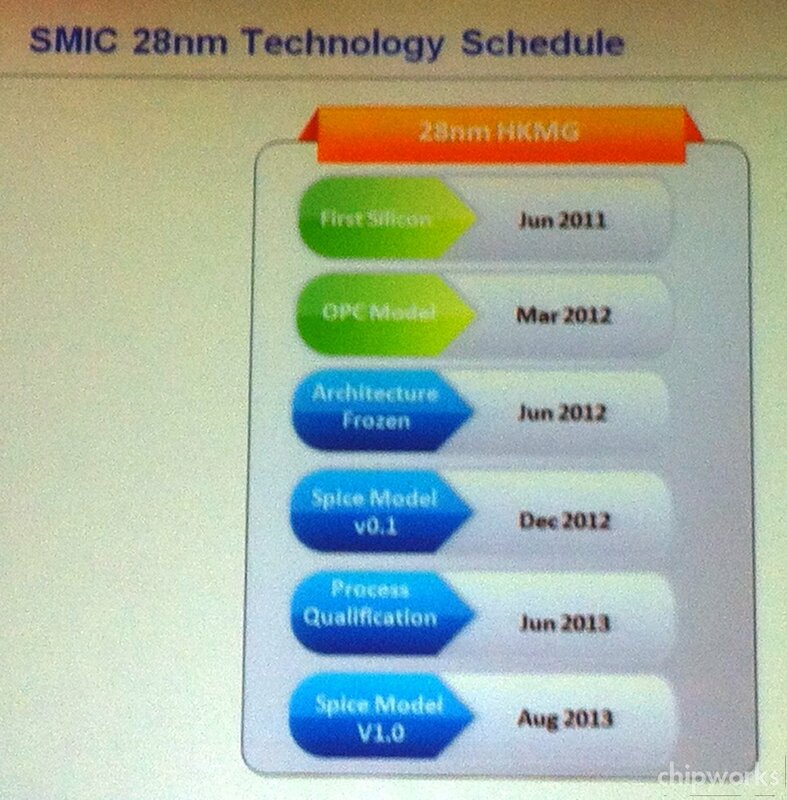 Scheduled for mid-2013, their 28-nm offering will be both high-k, metal gate and poly/SiON, and feature one of the smallest SRAM cell sizes to date. The images are all distinctly fuzzy thanks to the challenges of using a phone camera at some distance from a dimly-lit screen, but they show what I’m talking about. 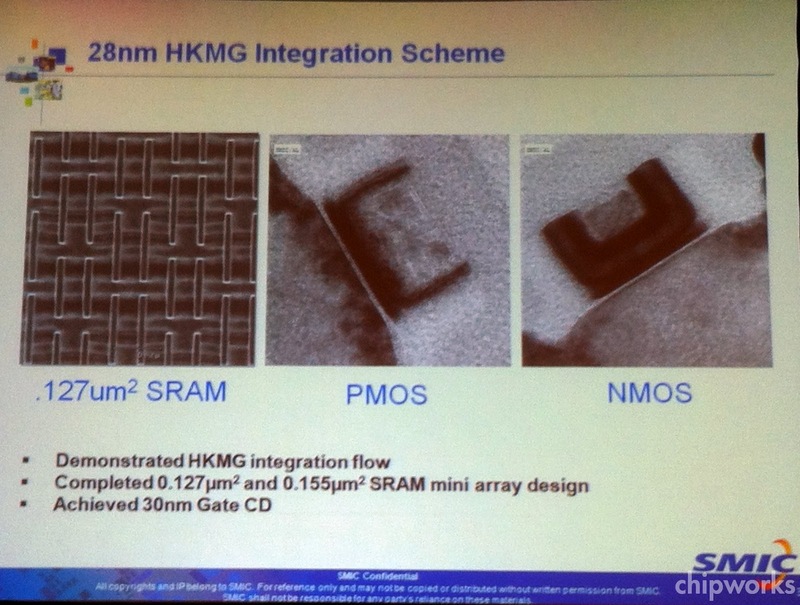 It appears that the gate-last structure has more in common with TSMC’s 28-nm structure than Intel’s 32-nm, and also that the NMOS and PMOS labels have been reversed. In all the other gate-last HKMG transistors we have seen, the thick TiN and Ta layers are in the PMOS (you have to squint to distinguish them in this image, but they are there), and I wouldn’t expect SMIC’s to be any different. We can also see the tell-tale notch at the base of the transistors that indicates that the gate dielectrics were formed before the dummy poly gate was put down. At less than 0.13 sq. 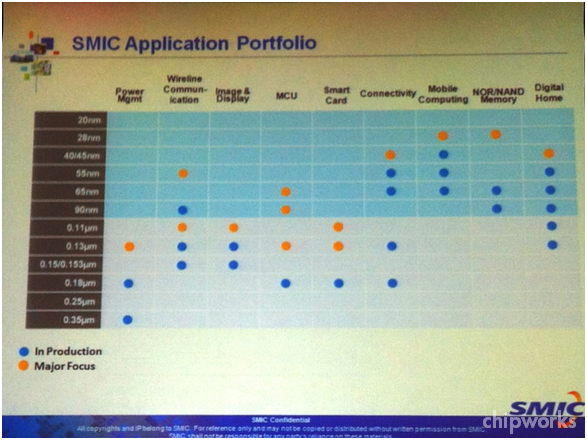 microns the SRAM cell is the smallest that I know of – TSMC is 0.15, and Intel 0.17 sq. microns. Just for comparison, here’s a pair of composite images of Intel’s 45-nm transistors and TSMC’s 28-nm transistors. You can clearly see the notches at the bottom of the gate structures that I refer to above. The inclusion of a poly/SiON variant (presumably low-power) at 28 nm puts them on a par with TSMC and UMC, and leaves GLOBALFOUNDRIES as the only major foundry without an announced non-HKMG LP process at that node. If the rumours about GloFo second-sourcing the Qualcomm S4 (currently on TSMC’s poly/SiON 28LP line) are true, presumably they’ll have to develop one!